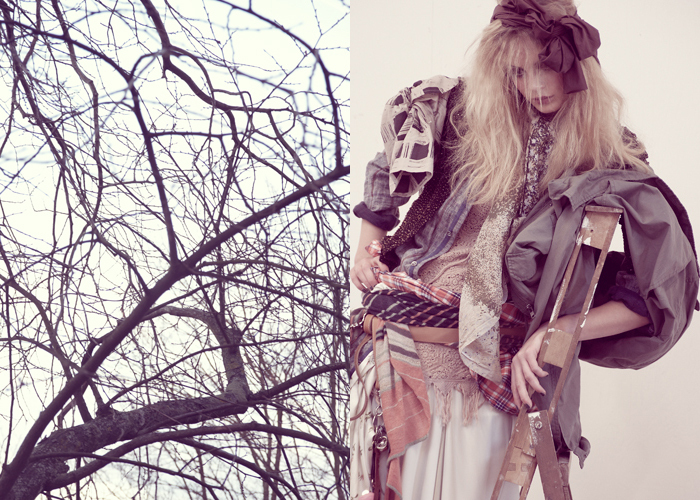 Photography by Tomas Falmer and Styling by Hanna Holmgren. Click for details. Sweather and skirt as a truban by Acne and Van Deur, jacket by acne, t-shirt by Fifth Avenue Shoe Repair, White cardigan and knitted jumper by Uniforms For The Dedicated, grey knitted jumper by Acne, dress by Lipsy, bracelet by Cooee and necklace stylist’s own. Knitted dress by Odd Molly, jeans-shirt by Uniforms For The Dedicated, cardigan by Minimarket, black and white blouse by Lee, army jacket by BZR, skarf by Bruuns bazaar, shirt around waist by Peak Performance, scarf around waist by RIka, belt by Wrangler, skirt by Marlene Birger, white skirt by Acne, flower skirt by Gant and scarf by Bruuns bazaar. Knitted dress by Odd Molly, jeans-shirt by Uniforms For The Dedicated, cardigan by Minimarket, black and white blouse by Lee, army jacket by BZR, skarf by Bruuns bazaar, shirt around waist by peak performance, scarf around waist by RIka, belt by Wrangler, skirt by Marlene Birger, white skirt by Acne, flower skirt by Gant and scarf by Bruuns bazaar. Pants by Twist & tango, jacket by Acne, coat by Filippa K, shirt around waist by Lee, vintage scarf around the arm by Beyond Retro, knitted skarf by JC and vintage hat by Beyond Retro. Tights by H&M, vintage scarf around leg Beyond Retro, stripy jumper by BZR, sweater by Uniforms For The Dedicated, hat by H&M wrapped in a scarf by Whyred and on top a sweater by Gant, jeans-shirt by Wrangler, shirt by Uniforms For The Dedicated, dress by Samsoe Samsoe, keyring and shoes by Acne. Dress as a hat by Manouch, printed sweater by Fnubbo, bag by Longchamp multi coloured cardigan by Tiger, hat on shoulder stylist’s own, dress by Fnubbu, skirt by Tiger, pants by Rika, knitted skarf by JC and scarf around the waist by Diesel. Dress as a hat Manouch, sweater by Fnubbu, bag by Longchamp, scarf on the bag by fnubbo, skarf around arm by BZR and sweater by Tiger. Photography by Tomas Falmer, Styling by Hanna Holmgren, hair and make up by Ignacio Alonso@Link Details and modeling by Victoria G@Stockholmsgruppen.